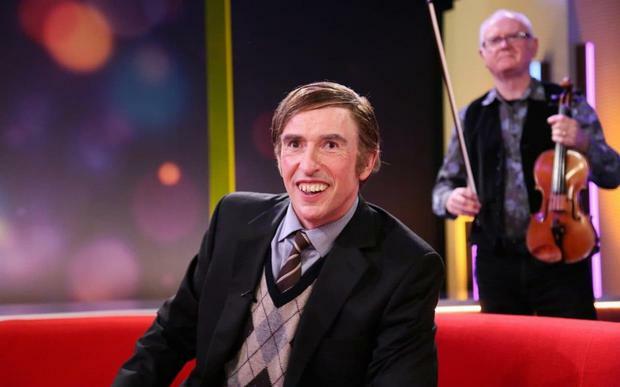 'Oh my God, that was like an advert for the IRA," says Alan Partridge after his doppelganger, Martin Brennan from Sligo, has just done a medley of 'Come Out Ye Black And Tans' and 'The Men Behind the Wire' on his ersatz British chat show. For most people from Ireland it was hilarious, but if it happened on Irish television there would be an outcry. But for Alan Partridge - the alter ego of actor and comedian Steve Coogan - it's part of his comedy show 'This Time With Alan Partridge'. His ability to both send up and cut you down with biting satire is peerless. There is a special irony that singing what we call "rebel songs" could suddenly arise on the eve of Brexit, when the "special relationship" between Ireland and England has become a tad testy. It is a time when talk of a United Ireland is once again on the agenda for a certain section of people in the Republic, nostalgic to resurrect the National Question, which most of us thought was gently put to bed with the Good Friday Agreement. As someone who grew up with rebel songs only to see them all but disappear during the 'Troubles' - apart from The Wolf Tones and The Barleycorn, that is - is it a sign of a new maturity that some of the blood-curdling lyrics of certain songs now seem acceptable again? In my experience, English visitors to Ireland always enjoyed hearing rebel songs in a pub sing-song. The good ones, like 'Down by the Glenside', 'The Foggy Dew' or even 'The Croppy Boy' were lyrical, they told a coherent story and were aspirational for an independent Ireland. But they weren't aimed at inciting violence, even if the English were "the baddies". They conform to Chesterton's view of the Irish that "all their wars are merry and all their songs are sad". The same could not be said about some of the lyrics that would later emerge, anthems like 'The Sniper's Lament', which I once heard inappropriately sung at a criminal's funeral in Dublin. Some of the really bad rebel songs seem designed as IRA propaganda to encourage impressionable people to commit acts of violence for "the cause". It is interesting too that Coogan chose to make a skit that included the lyrics of 'Come Out Ye Black And Tans'. It celebrates the exploits of the Old IRA in Cavan during the War of Independence - where in truth there was very little real action. But like all good singalong songs it has a rousing thump-the-table chorus. At least Coogan has an Irish background - his mother came from Mayo and he co-wrote and acted in the film 'Philomena' - even if he does come across as a quintessential English twit in his show. That is in stark contrast to another Englishman with an Irish background, Declan Rice, who has the distinction of putting out the inane tweet 'Up The RA' in 2015 and having to apologise for it now he finally got off the fence and decided to play his football for England. Good luck to him, but give me a rebel song in preference to an objectionable tweet any day.